Two-story house plans are homes with two stories, often separating living spaces from sleeping areas. Two-stories include ranch homes with finished lower levels and 1 ½ story homes. But, most 2-story plans are Traditional style homes with two full levels, one on top of the other. 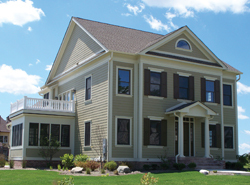 Georgian style, Colonial style, and Greek Revival house designs all have two-stories and offer a stately, refined look that can’t be ignored on any suburban street. The Sayer Creek Country Home has 3 bedrooms, 2 full baths and 1 half bath. 1944 Sq. Ft., Width 45'-0", Depth 55'-0"
The Indian Ridge Rustic Home has 3 bedrooms, 2 full baths and 1 half bath. 2902 Sq. Ft., Width 60'-0", Depth 50'-0"
The Timberway Craftsman Home has 3 bedrooms, 2 full baths and 1 half bath. 2289 Sq. Ft., Width 48'-0", Depth 56'-0"
The Upton Lane Traditional Home has 5 bedrooms, 2 full baths and 1 half bath. 2303 Sq. Ft., Width 54'-0", Depth 47'-0"
The Edie Hill Craftsman Home has 3 bedrooms, 2 full baths and 1 half bath. 2080 Sq. Ft., Width 45'-0", Depth 53'-0"
The Barker Woods Rustic Tudor Home has 4 bedrooms, 2 full baths and 1 half bath. 2535 Sq. Ft., Width 50'-0", Depth 42'-0"
The Marney Rustic Tudor Home has 3 bedrooms, 2 full baths and 1 half bath. 2278 Sq. Ft., Width 42'-0", Depth 46'-6"
The Ridgewynd Neoclassical Home has 3 bedrooms, 2 full baths and 1 half bath. 2605 Sq. Ft., Width 50'-0", Depth 42'-0"
2453 Sq. Ft., Width 48'-0", Depth 40'-0"
The Ridgefield Lake Country Home has 3 bedrooms, 2 full baths and 1 half bath. 2391 Sq. Ft., Width 59'-0", Depth 53'-0"
Two-Story home designs are perfect for busy families because they usually separate the main living areas from the sleeping areas. Browse our two-story plans here and see all types of styles and sizes that may be perfect for you to build.